Hello, friends! I Hope all those in the U.S. had a wonderful Thanksgiving. Now that the count down to Christmas can begin in earnest, it's important to remember the reason we celebrate Christmas in the first place. I have just a quick card to illustrate the real reason for the season. Creative Nugget: All papers stamps and dies used to create this Christmas card are from Our Daily Bread Designs. Papers from the Christmas 2013 Collection were used to create the background for The Babe image that was colored with Copic Markers. Each paper layer was cut with Pierced Rectangles Dies and matted with black card stock. 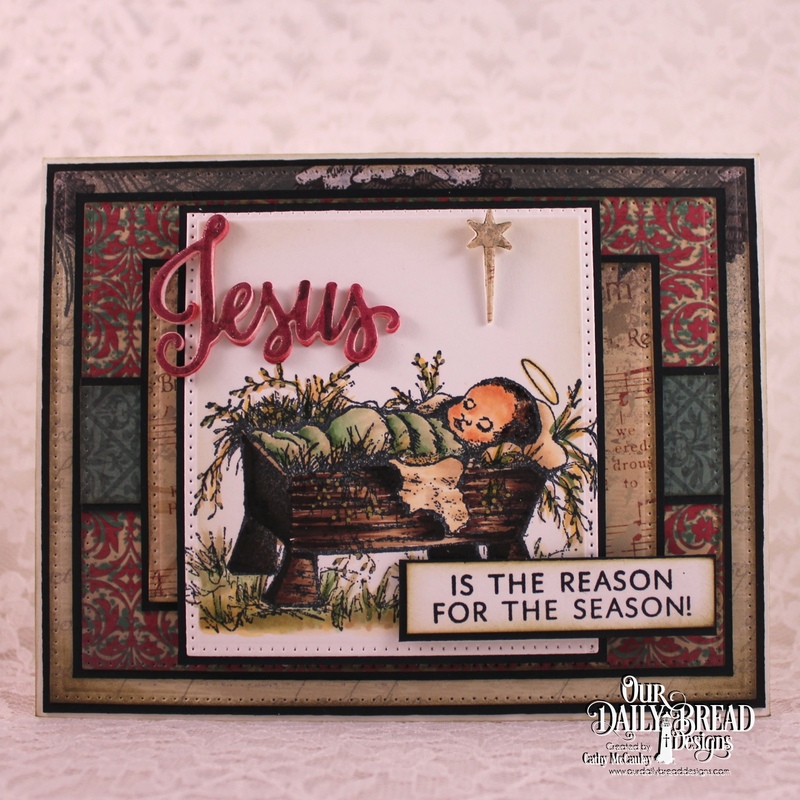 The new Jesus Loves You Stamp & Die Duo was used to create the sentiment and the star. A gold glitter pen and Wink of Stella were used to add some shimmer and finish the card. Thanks so much for joining me today...have a wonderful weekend! Hello friends! 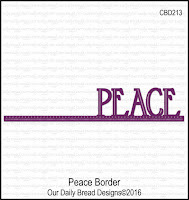 Today we are taking another look at the Our Daily Bread Designs November 2016 Release. 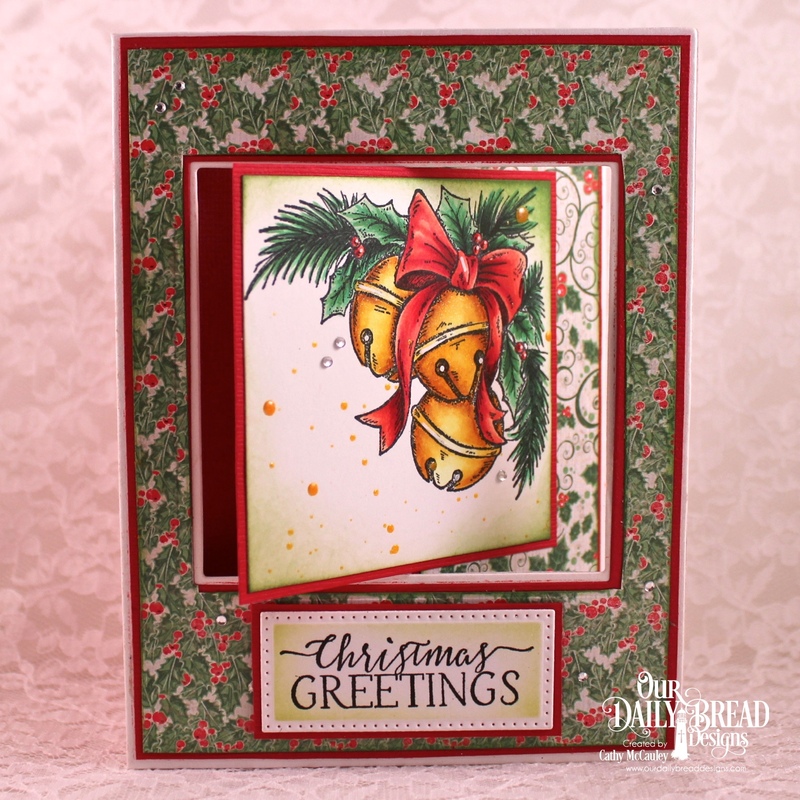 Christmas is creeping up on us and today we have some more beautiful Christmas inspiration for you made with the new products released this month by ODBD. Creative Nugget: The pre-cut and scored Lever Card base was layered with red card stock and papers from the Holly Jolly Collection. The bells from the Jingle Bell Time stamp set were colored with Copic Markers and some gold glimmer glaze was splattered on for some shimmer. The sentiment was cut with a Pierced Rectangle Die. 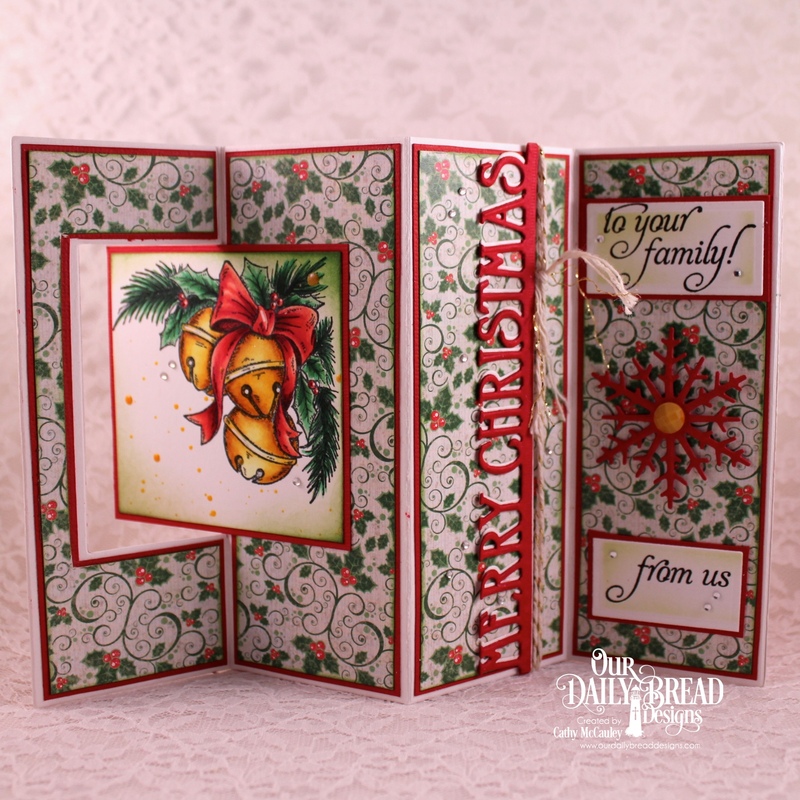 The Merry Christmas Border Die was cut and layered three times and adhered to the third panel. 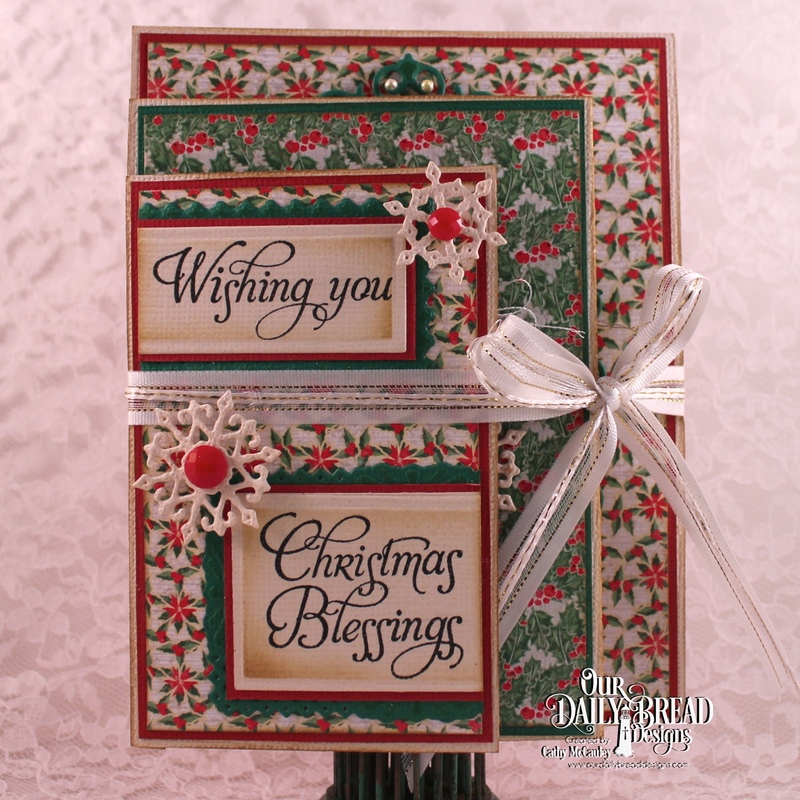 Sentiments from the Christmas Ornament stamp set were cut with Rectangles Dies and one of the Snow Crystals die cuts was added to finish the fourth panel. 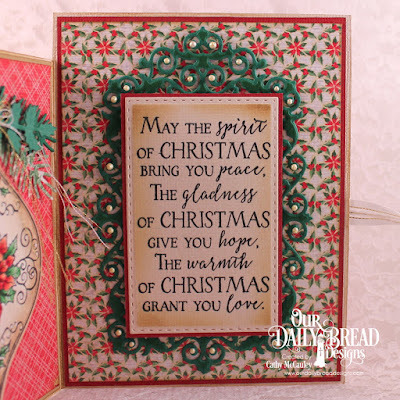 To see all of the wonderful Christmas creations stop by the Our Daily Bread Designs Blog. Then click on the links below to see all the details for each project. Hello, everyone! Today I am hosting the Ways To Use It Challenge on Splitcoaststampers and the challenge is to use a popped up element on your card. This was the perfect chance to make another fun Pop-Up Box card. Creative Nugget: The directions for this fun box can be found HERE. These cute penguins from the Holiday Hugs stamp set were colored with Copic Markers and popped up with small strips of acetate. Around the bottom of the box are snowy drifts cut with the Hillside Edges Dies. Some sparkle was added with Crystal Snow and rhinestones. This will go to my great-niece for Christmas. This is the last day to receive 20% off all Christmas/Fall stamp sets! Thanks so much for popping by…have a blessed day! Hello Friends! 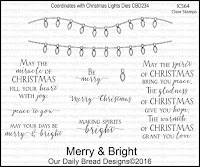 Welcome to the Our Daily Bread Designs Special Holiday Release…more goodies for your Christmas crafting! Just check out these gorgeous creations by the Breadstick Designers! 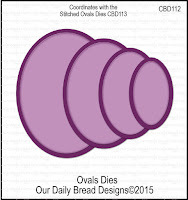 Three randomly selected winners will each receive a $25 gift certificate to the ODBD Store to be used toward the purchase of ODBD Stamps found in the "stamps column" of the website just for commenting on the Design Team cards! You have until November 16, 2016 at 9:00 p.m. EDT to leave your comments on the Designers' Blogs for a chance to win! The Winners will be posted on the ODBD Blog on November 17th, so be sure to check back there to see if you won! 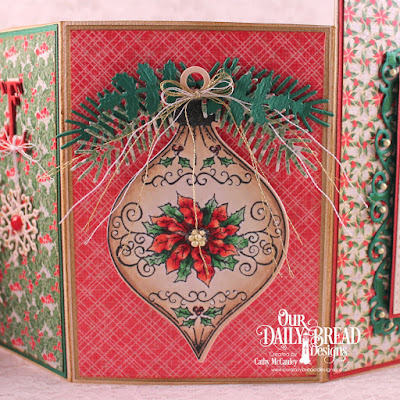 The new Christmas Ornament stamp set and coordinating Ornament Die were used to create both of my samples. 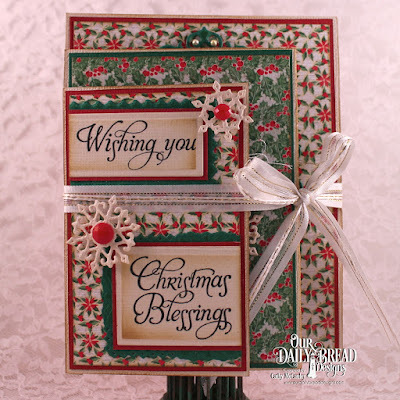 Creative Nugget: The Snowflake Border Background was white embossed and sponged on Neenah card stock. The second layer of the card was cut with the Snowflake Sky Die and embossed with clear sparkle embossing powder which really shimmers in real life! 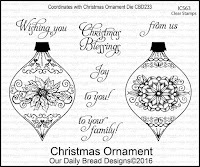 The Christmas Ornament was colored with Copic Markers and cut with the Ornament Die. Metallic thread was used to hang the ornament and a tag cut with a Mini Tag Die and a Circle Die was tied to the ornament. A few Bitty Sparkles were added to finish the card. A new fold found on Pinterest was the inspiration for my second sample. 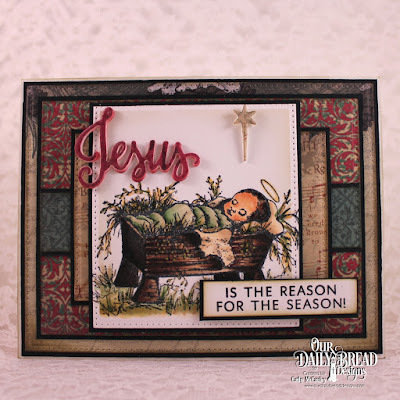 Creative Nugget: The four panels on this card gave plenty of space to use many of the new products released this month by Our Daily Bread Designs. 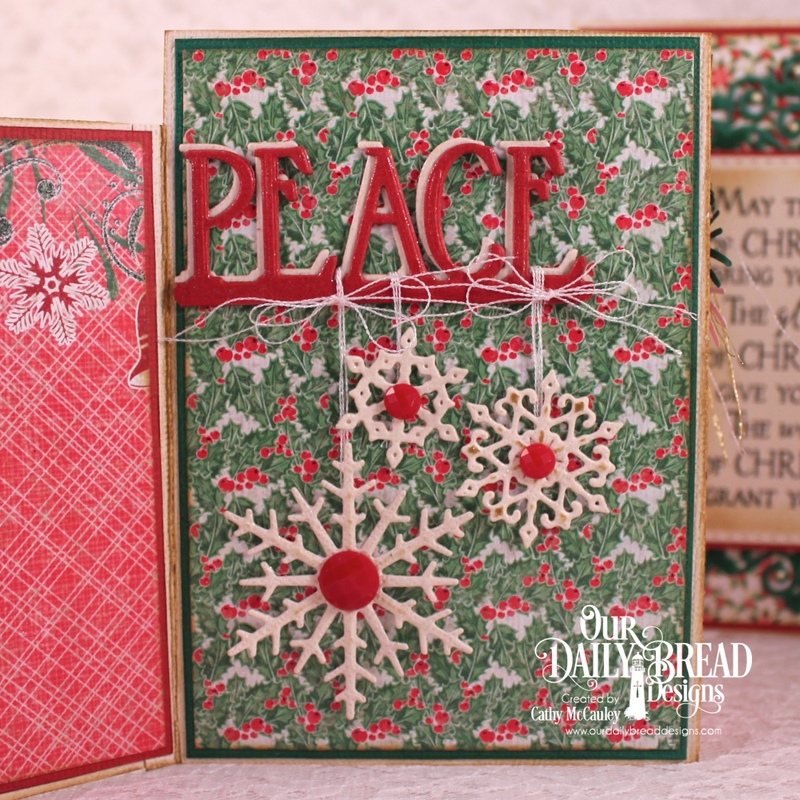 All of the panels were layered with papers from the new Holly Jolly Collection…LOVE! The split sentiments from the Christmas Ornament set were cut with Rectangle Dies and Filigree Frames Dies. 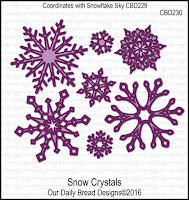 A few Snow Crystals accent the front of the card. The Peace Border was cut several times and layered for dimension. A few sparkly Snow Crystals were hung from the border on this second panel. 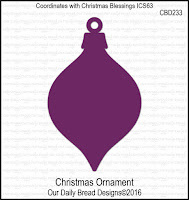 The Christmas Ornament was colored with Copic Markers and cut with the coordinating Ornament Die. 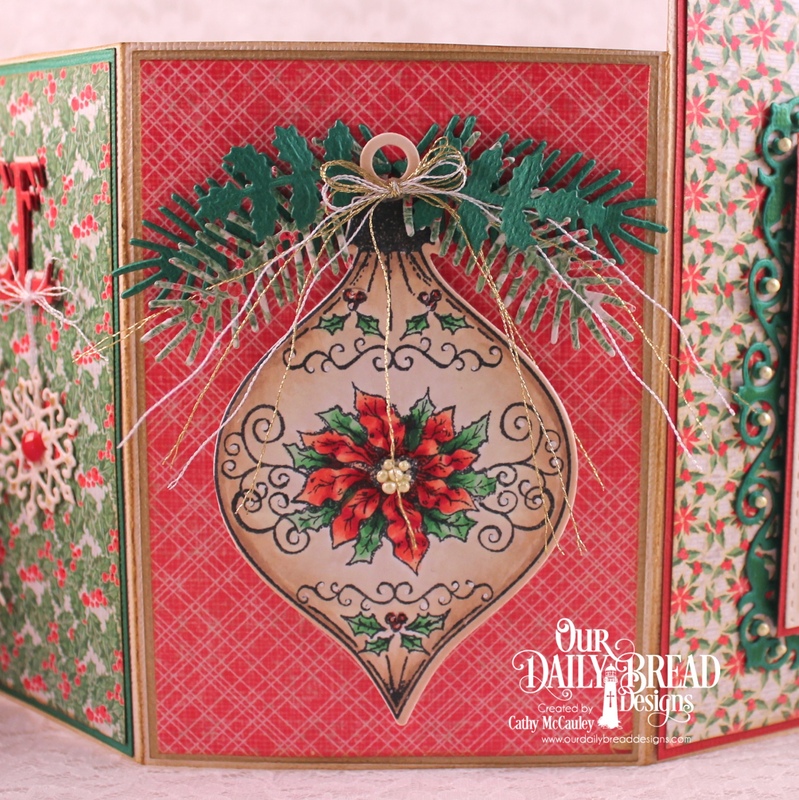 Prills were used in the center of the poinsettia and greenery cut with Lovely Leaves Dies and a metallic thread bow were added. 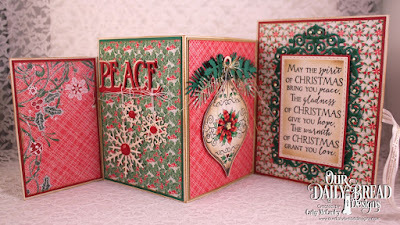 Panel four was decorated with a sentiment from the Merry & Bright stamp set released at the beginning of the month. The Double Stitched Rectangle Dies and the Filigree Frames Dies were used to frame the sentiment. Prills were added to the flourishes on the frame to finish the card. 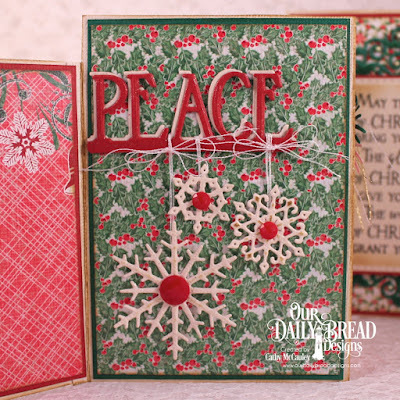 To see all of the gorgeous projects created with the Special Holiday Release, hop on over to the Our Daily Bread Designs Blog. Then click the links below to see the details for each project. While at each blog, be sure to leave a comment to be eligible to win one of the three fabulous prizes! Thanks so much for stopping by…have a holly, jolly day! Hello friends! The Mojo Monday sketch provided the perfect inspiration for another Christmas card. 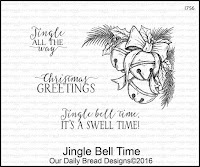 Creative Nugget: Love coloring this jingle bell image from the Jingle Bell Time stamp set released this month by Our Daily Bread Designs. The pretty paper is from the Christmas Collection 2015. 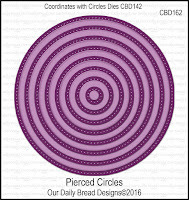 Pierced Squares Dies, Layered Lacey Ovals Dies, and Ovals Dies were used to cut and matt the main image and the sentiment. 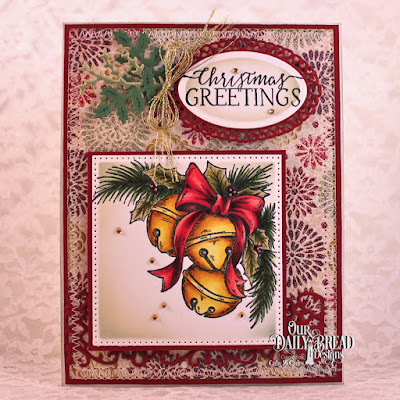 Lovely Leaves die cuts and a Flower Lattice die cut were used for the accents on the sketch. 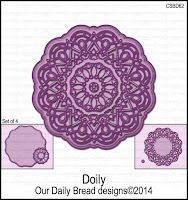 My second card was also made using stamps and dies from Our Daily Bread Designs. Creative Nugget: The tree from the Joys of the Season stamp set was colored with Neocolor 2 Crayons and spirited with water before stamping on the card front. The same tree and the sentiment were then stamped in Elegant Eggplant ink. 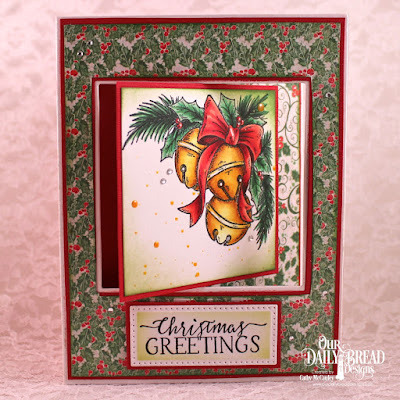 The paper behind the aperture is from the Christmas Card Collection 2016 and the dies used include the Holy Night Die, Pierced Circles Die, and a Circle Die. A little sponging was added to create snow drifts and tiny gems add a touch of sparkle. Thanks so much for stopping by...enjoy the beautiful weather! Hello Friends! How exciting...Sweet 'n Sassy Stamps is turning 9 this month and we are celebrating big time with lots of fun, prizes, weekly specials, and daily deals…it's all happening on our Facebook Page starting today! Be sure to join us live at 12pm EST for some exciting birthday festivities and to cheek out our Daily Deal for today! That's not all! This month SNSS is releasing four fabulous new stamp sets. I've been having fun with some of the new sets. 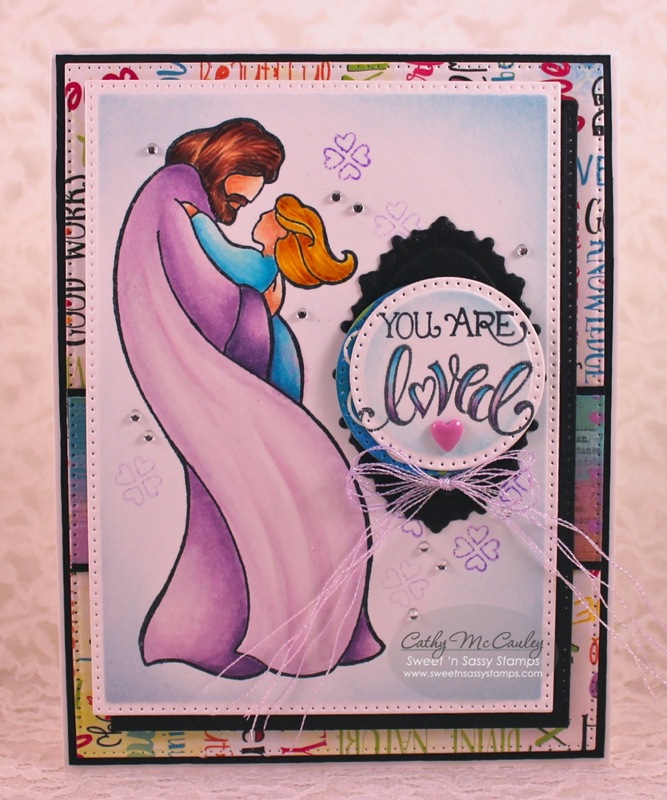 Creative Nugget: First is a new stamp set in the Jesus series designed by Krista Hamrick called My Friend. 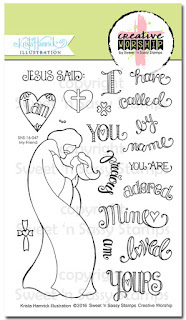 This wonderful set can be used for Bible journaling and for creating cards like this one. 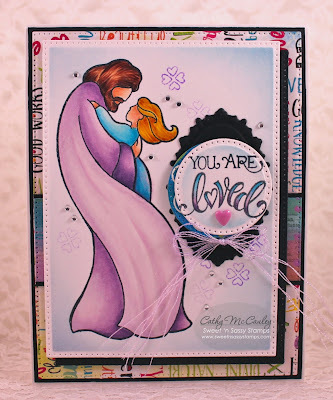 The Jesus image was colored with Copic Markers and layered onto some Bo Bunny papers. Fifteen words and phrases included in this set can be used to create custom sentiments for your creations. A few Bitty Sparkles were added to finish this card. 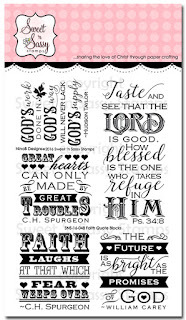 Creative Nugget: Four quotes and one scripture verse is included in a new set designed by Nina Brackett called Faith Quote Blocks. The Spurgeon quote on this card was stamped twice and some of the elements fussy cut and popped onto the block sentiment for a two-toned look. 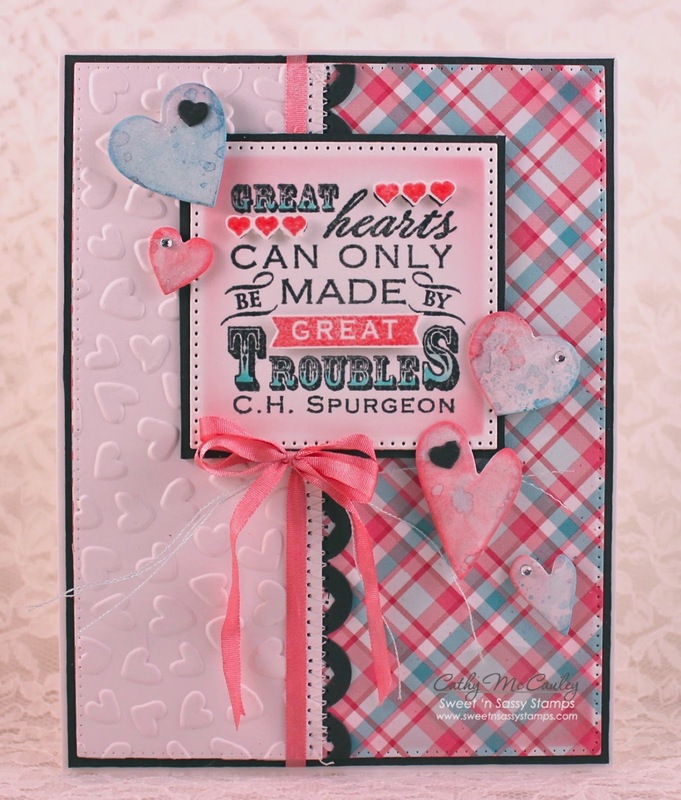 Some embossing and Lawn Fawn papers were used for the background with a Hearts Scallop Border. Some die cut hearts, a dyed silk bow, and more Bitty Sparkles were added to finish the card. Be sure to check out all of the new stamp sets by clicking the New! tab at the Sweet 'n Sassy Stamps Store! Thanks so much for joining me today…have a wonderful weekend! Hello friends! 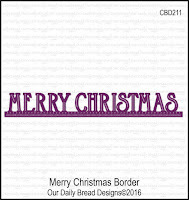 The countdown to Christmas is on the way at Our Daily Bread Designs. The November 2016 release includes one Stamp & Die Duo, two stamp sets, three fabulous dies, and a new Christmas paper collection! The ODBD Designers have made some stunning samples for your Christmas inspiration. 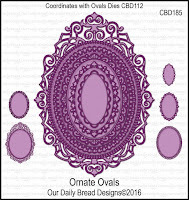 Three randomly selected winners will each receive a $25 gift certificate to the ODBD Store to be used toward the purchase of ODBD Stamps found in the "stamps column" of the website just for commenting on the Design Team cards! You have until November 2, 2016 at 9:00 p.m. EDT to leave your comments on the Designers' Blogs for a chance to win! The Winners will be posted on the ODBD Blog on November 3rd, so be sure to check back there to see if you won! 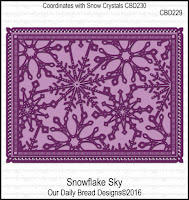 My first sample was made using the new Merry & Bright stamp set, the Snow Crystals Dies, and the new Snowflake Season Paper Collection. 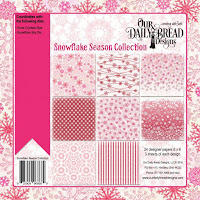 Creative Nugget: The new Snowflake Season Paper Collection is so pretty in pink, I had to use a little bit of all of it…stitched to some gray card stock for contrast. The hanging snowflakes were cut with the new Snowflake Crystals Dies and embossed with clear glitter embossing powder so they really sparkle. 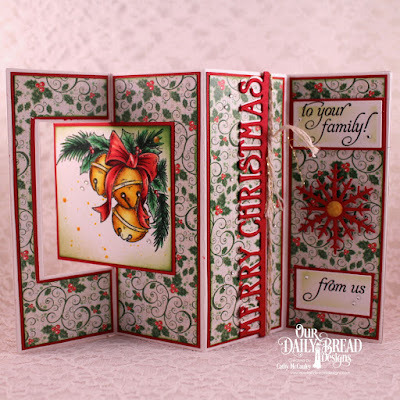 The sentiment from the Merry & Bright stamp set was white embossed on vellum and framed with borders cut with the Ornate Ovals and Ovals Dies. Little metallic thread bows and gems were added to finish the card. My second sample was made using the Jingle Bell Time stamp set, the beautiful Snowflake Sky Dies, and the Snowflake Season Paper Collection. 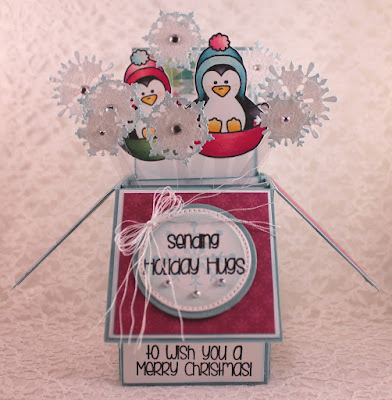 Creative Nugget: The card front was layered with Snowflake Sky die cuts that were sponged with a hint of blue before removing them from the dies. The beautiful bells from the Jingle Bell Time set were colored with Copic Markers, cut with a Circle Die, and matted with a Pierced Circle die cut. The Doily frame was accented with a few banners cut from Snowflake Season papers and pink card stock. Gems and silver cording were added to finish the card. 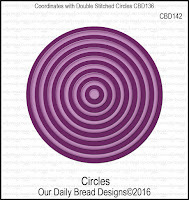 To see all of the dazzling projects created with the October Release, hop on over to the Our Daily Bread Designs Blog. Then click the links below to see the details for each project. While at each blog, be sure to leave a comment to be eligible to win one of the three fabulous prizes!